Mangum Mound Mangum Mound Site, Claiborne County, Mississippi 1350 to 1500 CE Plaquemine Mississippian culture Located at milepost 45.7 on the Natchez Trace Parkway. Various pottery fragments belonging to the Plaquemine culture, chunkey stones and several Mississippian copper plates, one with an avian design similar to other plates found Etowah in Georgia and Lake Jackson Mounds in Florida. These portray the Birdman motif important to the Southeastern Ceremonial Complex (S.E.C.C.). Nacoochee Mound Nacoochee Mound, White County, Georgia 1350-1600 CE South Appalachian Mississippian culture Nacoochee Mound, on the banks of the Chattahoochee River in White County, in the northeast part of the U.S. state of Georgia, at the junction of Georgia Georgia State Route 17 and Georgia State Route 75. First occupied as early as 100-500 CE, the site was later developed and occupied more intensively by peoples of the South Appalachian Mississippian culture (a regional variation of the Mississippian culture) from 1350 to 1600 CE. One of their characteristic platform mounds is located at the site. A professional archeological excavation revealed a total of 75 human burials, with artifacts that support dating of the site. ^ "Pharr Mounds-Ceramic analysis". National Park Service. Retrieved 2010-11-16. ^ Peregrine, Peter Neal; Ember, Melvin, eds. (2003). "Middle Eastern Woodland". Encyclopedia of Prehistory Complete set of Volumes 1-8 and Volume 9, the index volume: Published in conjunction with the Human Relations Area Files. Encyclopedia of Prehistory. 6:North America (1 ed.). Springer Publishing. p. 331. ISBN 978-0-306-46264-1. ^ Woodward, Susan L.; McDonald, Jerry N. (1986). 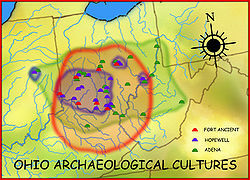 Indian Mounds of the Middle Ohio Valley: A Guide to Mounds and Earthworks of the Adena, Hopewell, Cole, and Fort Ancient People. Blacksburg, Virginia: McDonald & Woodward Publishing. pp. 252–257. ISBN 978-0939923724. ^ "Tejas-Caddo Ancestors-Woodland cultures". University of Texas at Austin. Retrieved 2010-10-17. ^ Brookes, Samuel O. (1976). The Grand Gulf Mound: Salvage Excavation of an Early Marksville Burial Mound in Claiborne County, Mississippi. Mississippi Archaeological Survey Report. Jackson, Mississippi: Mississippi Department of Archives and History. ^ Kevin E. Smith; James V. Miller (2009). Speaking with the Ancestors-Mississippian Stone Statuary of the Tennessee-Cumberland region. University of Alabama Press. pp. 68–77. ISBN 978-0-8173-5465-7. ^ a b "Caddo Mounds-Sites-Texas Native Skies". Retrieved 2010-02-05. ^ "The Caddo Indians of Louisiana". Archived from the original on 2009-12-10. Retrieved 2010-02-24. ^ Girard, Jeffrey S.; Emerson, Thomas E. (July 2004). "DATING GAHAGAN AND ITS IMPLICATIONS FOR UNDERSTANDING CAHOKIA-CADDO INTERACTIONS". Southeastern Archaeology. 23 (1): 57. Retrieved 2010-02-24. ^ "The Caddo Indians of Louisiana". Archived from the original on December 10, 2009. Retrieved 2010-02-24. ^ "Mangum Mound Natchez Trace". Retrieved 2012-04-27. ^ Cotter, John L. (July 1952). "The Mangum Plate". American Antiquity. 18 (1): 65–68. doi:10.2307/276247. JSTOR 276247. ^ "Southeastern Prehistory:Mississippian and Late Prehistoric Period". National Park Service. Retrieved 2012-04-10. ^ Brennan, Tamira K. (October 2009). Domestic Diversity at Kincaid Mounds. Midwest Archaeological Conference. Iowa City, Iowa. p. 2. Retrieved 2011-02-19. ^ "Shiloh Indian Mounds". Retrieved 2010-06-30.